It seems safe to say the Great British Summer is well underway with plenty of hot, sunny days already and we’re only just past mid-June, but let’s hope there are many more still to come and the school holidays aren’t a wash out! 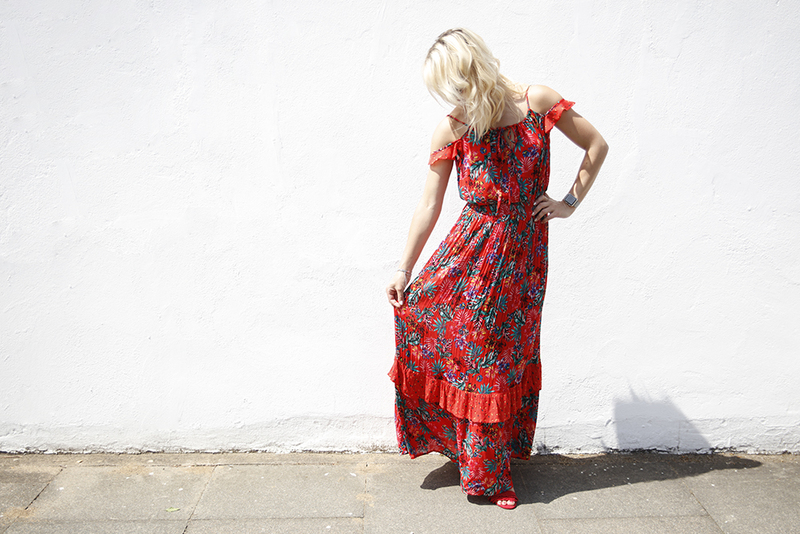 Let us embrace the glorious weather (and think ahead to holiday wardrobes) with a bright and breezy maxi dress embracing the floral, cold-shoulder and ruffle trends all in one easy to wear dress. With a crinkle finish and busy print this dress is just perfect for mamas both at home and away; it’s meant to be creased – no ironing nor careful folding for packing required – and the pattern will disguise anything your little ones quite literally throw at you. 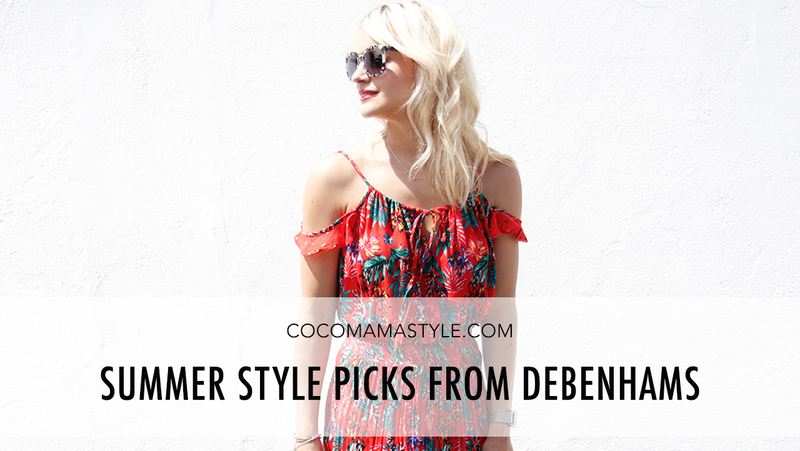 It goes without saying a great sunhat is essential; if nothing else, it makes no-time-to-brush-bed-head look instantly chic! Update your eyewear this season with a slight cat-eye shape and switch up tortoiseshell for a grey version or metal trim. The classic black swimsuit gets a revamp with mesh panels offering a flash of waist while holding everything in. Neon? Check. Pom poms? Check. Slogan? Check. All the elements for the ultimate SS17 straw tote bag. 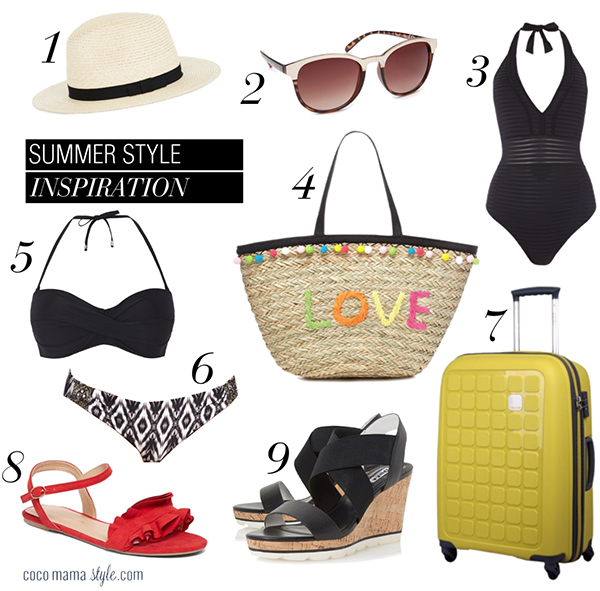 Mix-and-match your bikini tops and bottoms for multiple options while on holiday; it’s good for varying tan lines too! Choose one plain bikini – block colour or black – and one printed bikini which picks up on your block colour choice within the pattern for a mismatch that works. Make life easier at the airport with a bright case. It’ll distract the little ones from their boredom while waiting by the baggage carousel as they play Spot The Brightest Case. Complement your printed red maxi dress with a ruffle detail sandal. I opted for my fringed strappy stiletto sandals from last year with this dress but a more practical option would be these flats. For a bit of height without losing comfort, these Dune elastic strap wedge sandals hit the mark. And with the white sole contrasting the black straps, they add a sporty vibe to your style. Hello Helen, wow! what a gorgeous dress, I just loved it. I liked your collection. I always prefer this type of outfits. I like your panama hat. You have an awesome collection. Thanks for sharing latest trendy dresses. Thanks for sharing this post with us. Honestly i wish i could look fabulous just like you are those dress. keep up the good work, Awesome!! !